This is one of my top favorites as well - I'm so glad you enjoyed it! For some reason it doesn't seem to get as much notice. And I agree with you about the subplots being more interesting than the main. I just dote on Aunt Stanbury! I haven't seen the adaptation you mention, but I'm tempted by Bill Nighy as Col. Osborne. Aunt Stanbury was my favorite -- I've started watching the series and Anna Massey is brilliant. Bill Nighy isn't quite how I pictured Col. Osborne -- I think he's a bit more buffoonish in the book, but Bill Nighy is a little more believable as a man who ruins women's reputations. 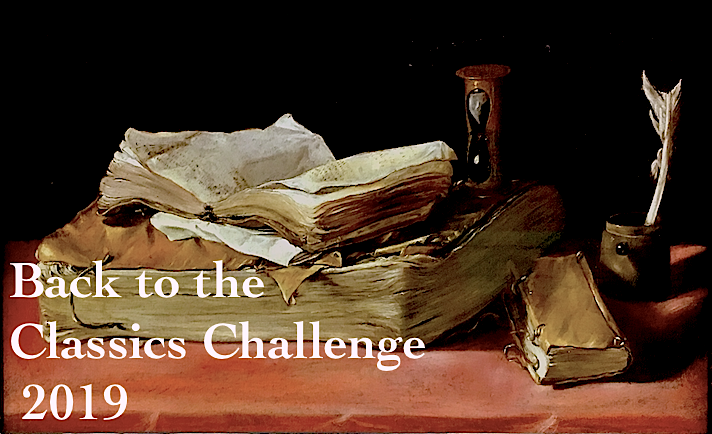 I swear I am going to finally start with Trollope this year! (Okay, I say that every year but I have to actually do it sometime.) I think this is the first book on my list so I'm glad that it is a good one! Trollope's books can be long, but they aren't difficult reads compared to most Victorians -- I can sometimes finish a Trollope in a week, but I don't think I could do that with Dickens. My first was The Way We Live Now which is also long, but riveting. Well, it was probably closer to 10 days, but that's still pretty good for an 800 page book! I did have a lot of down time last weekend, and I was dying to find out what happened. I know I wasn't supposed to post until April 2, but I just couldn't hold off that long. And Middlemarch was great, but I think it took longer. I remember the first 100 pages were sort of dry, but it really picked up after that. I just finished the Barchester series last year!! I know I should start on the Pallisers but I'm a little afraid to get sucked into another long series so I'm trying to read more of the standalone Trollopes -- I still have about a dozen and some of them are relatively short. I found about 10 last year at Half-Price Books and couldn't resist them. I have only read the first three in the Barsetshire series. The Warden is my favorite because I love Mr. Harding and just because it was the first book I read, but all three were excellent. I know I will read more Trollope but I want to complete the Chronicles first before I move on to any stand alone novel. That's interesting -- I found The Warden a little slow, but I was so glad I stuck with it because it's really tied to Barchester Towers which I loved. Doctor Thorne was my other favorite in the series, but they're all good. My Classics Club Spin book was Can You Forgive Her? I'm reading it now and enjoying it, though I think it's going to take me a lot longer than a week to read it! He Knew He Was Right sounds great but I will probably try to finish the Palliser series first before reading the stand-alone books. I do want to get to the Pallisers -- I have the whole series on my TBR shelves. However, they're mostly really long and I hesitate to start a whole new series. I'm going to try to get through some of the stand-alone books first. Of course my library does have Can You Forgive Her? as an audiobook so that's tempting! Wow, I'm impressed that you read this so quickly - it must be riveting! 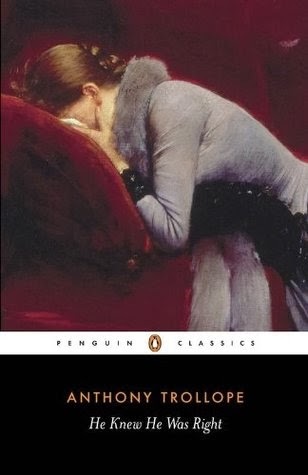 I struggle to like Trollope and have had a hard time reading his books so I've only finished one. I want to like him so badly, but I might have to give up that dream. Maybe he is just not for you -- I find his books very easy to read and usually read them pretty quickly. It was about ten days for this one, although I did have a lot of down time last weekend and made a lot of progress. My previous Trollope read was Orley Farm which didn't go nearly as fast. I did find that one to be more repetitive. I have been wanting to reread this one. I just loved it. It isn't my favorite-favorite Trollope, but it's so very, very good! I also did not care for the "main" couple, but the other characters I enjoyed so much that it more than made up for it!!! I agree, Louis and Emily were the least interesting. I found Nora Rowley and Dorothy Stanbury to be much more interesting, and Rev. Gibson was just a hoot. Oh, I didn't know Anthony Trollope wrote thát many books! I've not read one of them yet.... Your review mirrors my feelings after watching the BBC miniseries though, the 'side' stories where way more interesting compared to the main storyline. I have read a lot of Trollope and like his sly social humor. Favorites include The Way We Live Now (financial chicanery), Can You Forgive Her (beginning of the Palliser series) and The American Senator (fox hunting and husband hunting). 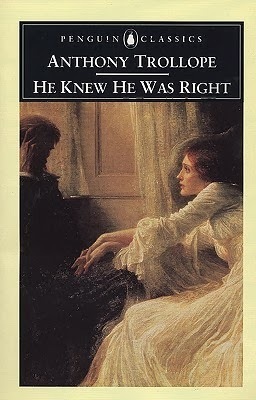 I did enjoy He Knew He Was Right but my favourites are the Palliser novels although I'll always have a soft spot for the Barchester books, which was the first series which I read. The more Trollope I read, the more I like him, which is good because he has so many books. I am looking forward to reading this one, eventually, but meanwhile I can relate to the idea of the main thread of a novel getting worn and finding the subthreads more interesting. Great idea to watch the series. I have recently been told about the BBC series of Pride and Prejudice and now Wives and Daughters. Where have I been all my life? I've been missing out. The Pride and Prejudice series was awesome, and I'm looking forward to many more.